A shrine at Shoalwater Bay, Queensland, at which to venerate the Blessed Franz Jaegerstaetter. On 26 October 2007, at the Catholic Cathedral in Linz, Austria, Franz Jaegerstaetter was beatified in a service led by Cardinal José Saraiva Martins. Some 5,000 people attended the service. Starting in 1938, Franz Jaegerstaetter had quietly resisted the Nazi Party, the wars started by Nazis, their military draft, and the silence of his church in relation to what he clearly saw as mortal sin. Between 1938 and 1943 Franz and his wife Franciska brought three daughters into the world, as they deepened their Christian faith and practice. On 9 August 1943 Franz Jaeggerstaetter was executed by guillotine for refusing military service with the German Army. In June 2007, Pope Benedict 16 declared Franz Jaegerstaetter a Catholic martyr and set him on the path to Sainthood. The story is not free of blemish. During the Nazi regime many Catholic clergy dodged the issues of militarism, war, and their church’s spiritual obligation to stand up for peace and against violence. After the Nazis fell, these same clergy swept the Jaegerstaetter story under the carpet, while the civil authorities denied his wife the pension he had earned. Franz was criticised by fellow Catholics for failing to act responsibly as a husband and father. As he had often lamented, the church leadership of that time “were not given the grace” to refuse cooperation with the Nazis. Franz was protected for part of his resistance by the village community and church among whom he lived. At their urging he accepted earlier terms of military service in noncombatant roles. By 1943, he had come to a position where he would formally refuse any kind of armed service as being incompatible with his Christian beliefs. I became aware of the Jaegerstaetter story in 2009 when my friend Jim Dowling proposed him as a saintly figure in whose name a daggy little nonviolent affinity group could take action, and resist the military training for war being undertaken at Shoalwater Bay in central Queensland. Exercise Talisman Sabre involves the US military and the Australian military practicing how to invade other countries together. So in July 2009, Jim Dowling, Culley Palmer, and I briefly became the “Jaegerstaetter 3”. We trespassed illegally into the military training area in an effort to stop live-firing and disrupt the exercises. The journey was revelatory for all of us. To be in the beauty of God’s wilderness, to hear and see the disfiguring operation of military equipment disturbing that beauty, and to realise these very pieces of equipment when they leave here will be used to murder children in Afghanistan, Iraq, and Pakistan…. lends a certain perspective to Jesus’ call for peace and love. The Jaegerstaetter 3 was one of three affinity groups that trespassed into Shoalwater Bay in 2009. Now it’s 2011, and in one month a new Exercise Talisman Sabre will be under way. The forces are already gathering. Australia has been killing in Afghanistan for over nine years. We can add Libya to the list of countries where the US is practicing war, and they are obviously preparing to murder children in Syria as well. Australian foreign minister Kevin Rudd is a prominent urger for these new wars. In July range of peace and nonviolence activists will respond once again to Talisman Sabre with both protest and resistance. The overarching banner is called the peace convergence. 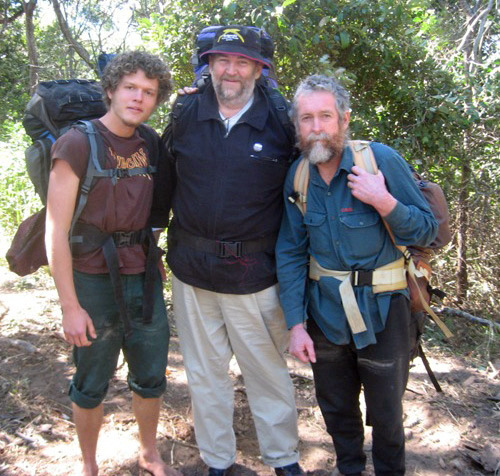 One small element will be the “Shoalwater Wilderness Pilgrimage”. Early in July, a small group will enter the Shoalwater Bay training area just before the exercises. There we’ll establish a shrine to the blessed Franz, and we’ll pray for the grace and courage to take effective action against war. Just as the church was at its beginnings, the precise location of the shrine will be secret from the authorities. The location will be recorded by GPS and made known to those peace pilgrims who wish to visit. I’m confident that meditation and prayer at this shrine will deliver to each pilgrim a clear vision of their pathways to peace. Willingness to participate in civil disobedience and nonviolent direct action is a pre-condition to finding the shrine. Beyond the shrine, during the exercise proper, some faith-based activists will carry out a “ploughshares action” aimed at disarming (damaging) a US military helicopter. I want with all my heart to be one of those activists. To use a mattock and smash the machines that cause death. In doing this I’ll be acting in veneration of Franz Jaegerstaetter, with Christ’s commandment in my heart. “Love one another as I have loved you”. This may make me a crack-pot, but I don’t believe that’s true. Part of Franz Jaegerstaetter’s story was the isolation he felt in standing against war. He never knew until just before his execution that other Christians, both lay and clergy, had shared in his resistance. That stories of the German/Austrian response to Nazism had been suppressed. In isolation it can be hard to remain optimistic. In Australia in 2011 we know more than did Franz. Circumstances are different. We know that 62% of Australians want our soldiers out of Afghanistan before Christmas. We can see clearly that our senior politicians are craven, undemocratic and subservient to US military adventures. Our Prime Minister and Foreign Minister acquiesce to and even urge the slaughter of innocents, hoping to buy some form of “protection” from the murderers. The church leadership, to their shame, are silent. As lay members of the body of Christ on Earth, I guess it’s up to us. Thank you for your dedication…not crackpot. !